Modern Quilting by B: My "Gemstone" Paper Piece Block is in Quiltmaker's 100 Blocks vol. 12! My "Gemstone" Paper Piece Block is in Quiltmaker's 100 Blocks vol. 12! Quiltmaker's 100 Blocks Volume 12 is featuring my Gemstone foundation pieced quilt block! It even made the cover! Despite its complicated appearance, this block is fast and easy to make. Give it a try, you wont be disappointed! This is the Gemstone block that is featured in the magazine. It measures 12'' x 12'' and can easily be scaled up or down to suit your needs. This coloration reminds me of an amethyst, wouldn't it be fun to make a giant ruby or an emerald? A three block by four block arrangement would make a great baby or lap sized quilt and would make a great gift for your favorite little "gem"! If the thought of making a twin sized quilt is a bit overwhelming, spacing out the blocks with some simple four patches would cut the work nearly in half. Don't be afraid to experiment with color. There is no need to stick with the gem tones. How about a nice pink ombre or a striking aqua and orange combination? I particularly like the Halloween combination, it has a vintage feel to it. I don't think there is a little girl out there who wouldn't like a pink ombre gemstone bed quilt. I wouldn't mind having one myself! 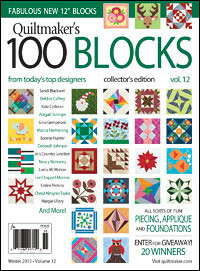 The publishers of Quiltmaker's 100 Blocks will be giving away a copy of Volume 12 to one of my lucky visitors. All you need to do to enter for a chance to win is leave a comment on this blog post; only one comment per person please. Be sure to include an e-mail address for me to respond to so that I can get in touch to receive shipping details. The draw will take place at 9:00 am US Eastern on Saturday, November 21, 2015. The winner will be informed by e-mail and will be announced by an edit to this blog post. The magazine will be sent to the winner directly from Quiltmaker. "Great block, looks complicated, but beautiful. Thanks." Congratulations Krazycat! Krazycat has been contacted by email. 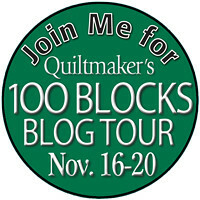 November 16-20 2015, Quiltmaker is hosting a blog tour for many of the Volume 12 block designers. It promises to be a fun and educational event with lots of fresh ideas and giveaways. Be sure to check it out! Great block, I like the layout with the four patches - the gems look like they're floating. Your gemstone is lovely; you chose perfect colors for it! I've two little granddaugthers and they will love the gemstone! Thanks for the chance! Very pretty block B! And there was no mention of being a Covergirl! Shame on you! Congratulations on your continued success! What a awesome block! Love the way the gems stand out. I love jewel tone fabrics, and this block sets them off perfectly! Love it! What a jewel of a block! It would look great in so many colorways and fabric genres, from 30's to batiks to random scraps. Thanks for the giveaway opportunity. Such a great block, looks amazing in different colors. Beautiful and different block, I think it would be beautiful done in ombre. Great block--love seeing it in different colors! Thanks for sharing! What a great block. I love paper piecing. This is a pretty block with many ways to color it and arrange it. Thank you for the chance to win. Really nice job on your post, Barb! Thanks for being with us on the blog tour. We really appreciate it. Have a great week! And I can't wait to see your book! Wow! That block is awesome. Congrats and thank you for a chance to win. The spacing on the twin quilt really lets the gems shine. Fabulous block! !.Love paper piecing,this year I sew many blocks with it. Could see your block in scrappy colors too! That's a pretty block. Even though it is paper pieced (but I need to gain experience with that anyway). What a pretty block, it really sparkles! Great block design! The inspiration for this is endless. Thank you for joining in on the designing. I love seeing all the new blocks. What a cool block! Thanks for the giveaway. Great block. Good way to use scraps. Very cool block! Thanks for showing the setting options--so helpful! What a great block - I'd like to make a rainbow version! That is an eye catching block. I love the design where they look to be floating off the top. Love your block. Possible color combinations are endless. Oh I do love this block!! Thanks for the opportunity to win. Your block reminds me of spinning tops, or the spinning Christmas ornaments from years past. Very nice. Love your Gemstone block...so many color options!! 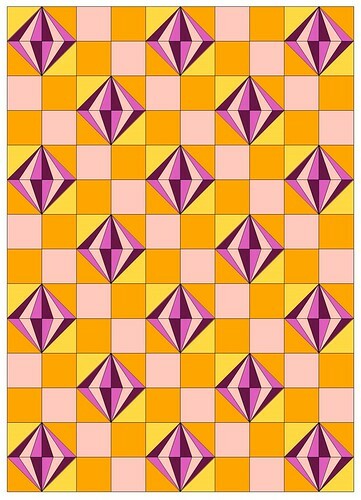 I love the block, I had a fleeting thought about how a quilt would look with several different gemstones. I may sketch it to see. Fascinating block. I love this magazine and have every issue. Thanks for a chance to win. 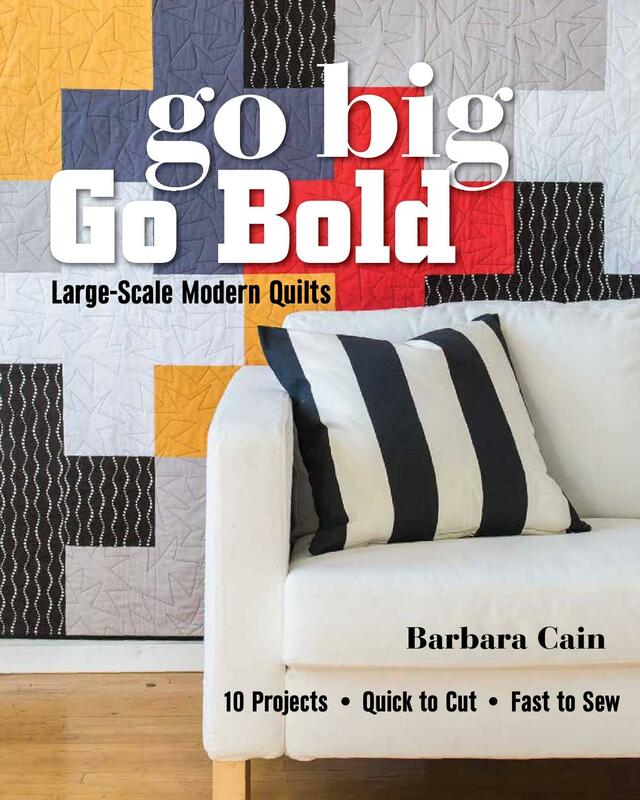 Congratulations on making the cover of Quiltmaker's 100 Blocks! I enjoy foundation piecing and love your Gemstone block. What a lovely block! Congrats on being included in this latest issue! This block looks amazing and changes so much with color placement. Beautiful block. Thanks for the chance to win! Fun block! It would be great as an engagement quilt. 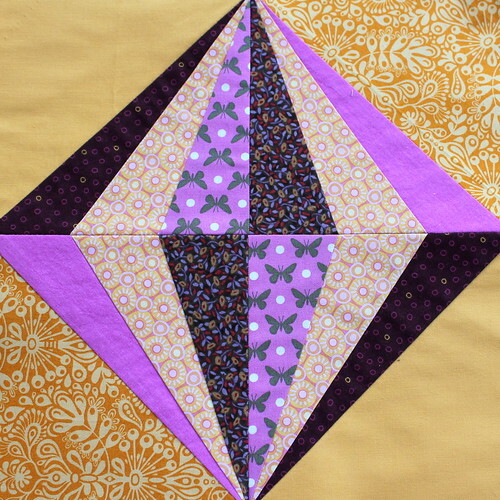 Love the movement of this block, and I do so love paper piecing. Beautiful block! Love the layouts you showed. Congratulations on being in Quiltmaker's 100, Vol. 12. How do you designers keep coming up with these interesting blocks? Thanks for the chance to win. It does look difficult but I am willing to try it! Thanks and Congrats to you! I've thought about how cute a gemstone block would be. You've done the work for me! I like it very much. Love your gemstone block. Congrats to you! Just tried my first paper piecing block recently. So much fun. That is one beautiful blocks. I do think it looks better with the four patches. It stands out more. I'm trying to imagine it with other simple blocks. 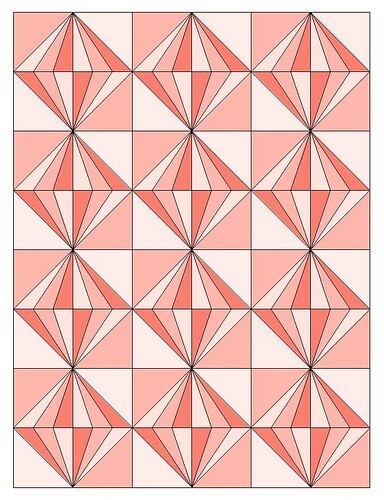 I would like to make a two block quilt. Thank you! Great block, love the orange and black version! It would be great as a colour wheel as well. Your block is very pretty. I can see it in many colors. I think it would be cute for an engagement present too. would love to do this using foundation piecing to make sure the seams all match! Great block, look complicated, but beautiful. Thanks. I love paper piecing and your block. Congratulations on being a cover girl! I see this block done in winter fabric. I love your gem stone block. It would be fun to make in each month's birthstone. Thanks for sharing. What a lovely block! It has all kinds of possibilities. I admire your block and think that it does resemble an amethyst. Nice job. Great block design with total #CreativeGoodness. 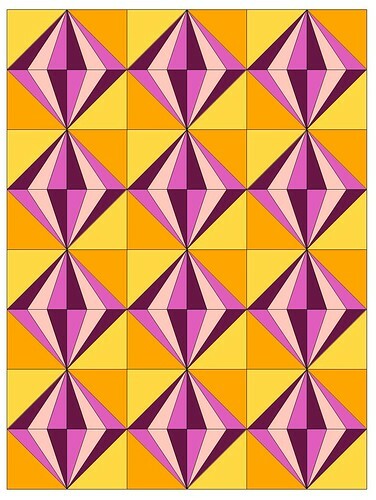 Definitely a fun design for free-motion quilting fun too! I definitely want to create with your block design. I like your block. Thanks for the chance at the giveaway. love the faceted diamond-and your sample patterns. Wow, SOOOO many options on this block! Thanks for sharing it! Gasp! I LOVE this block, best one I've seen yet! Absolutely love your block. Just think of a quilt with all different gemstone colors! Nice! I love seeing your design process, with different colors and layouts. I'm thinks mixing it with snowflake blocks and make an ice or winter gemstone quilt! Great block! I love how it seems to be floating in the one layout. Congratulations on having your block in the magazine. Thanks for the giveaway. Totally cool block!! I can see making a quilt for a September birthday girl using all the colors sapphires come it!! Stunning!! Very interesting block. I enjoy this Blog Hop each year and seeing all the inspiring patterns in the new issue of 100 Blocks. You're right...this would make a wonderful little girl's quilt. There are so many neat ideas for your block --- hard to decide on just one! This is a fun block. Great block. Learning to paper piece is on my bucket list for 2016. I like the scrappy potential in this block. Great block - love all the possibilities. Lovely block with so many options! I really like this one. I see my Batiks going to good use. This is a very unique block and I love it! I think it would look gorgeous in some pretty batiks! Love YOUR BLOCK!!!! I can see it with retro christmas fabric! Definitely adding to my list to do!!! !Congrats on your block! (shhh… it's one of my fav's of the entire blog hop! I love this block design! I can see making one in all the colors of jewels, in the same quilt! Can't wait to get started.